Finding a good hardscape analogy is like finding a needle in a haystack. So get ready … we’re about to unleash four of them in this new blog post! Certain hardscape topics are difficult to understand (even for us, sometimes). When we train our new employees and our product line dealers, we like to break things down in layman’s terms. Here are four perfect analogies that will help clarify some of the more complex hardscape topics. 1. Over-applying sealer is like layering pieces of Scotch Tape. All Alliance Gator sealers are designed to be a one-coat application process. Many customers ask if they can apply additional coats as a way to enhance the surface even more. Our answer to that is, “Noooooooo!” Here’s why … over-applying sealer will lead to a white or hazy appearance (and can cause delamination as well). Picture placing a piece of Scotch Tape on top of a newspaper. With only one piece, you can clearly see what’s underneath the tape. However, as you add a second … third … fourth piece, the area beneath the tape will begin to look more and more blurry. The same exact thing will happen to pavers if you over-apply sealer! Want to learn more on how to prevent sealer issues like this one? 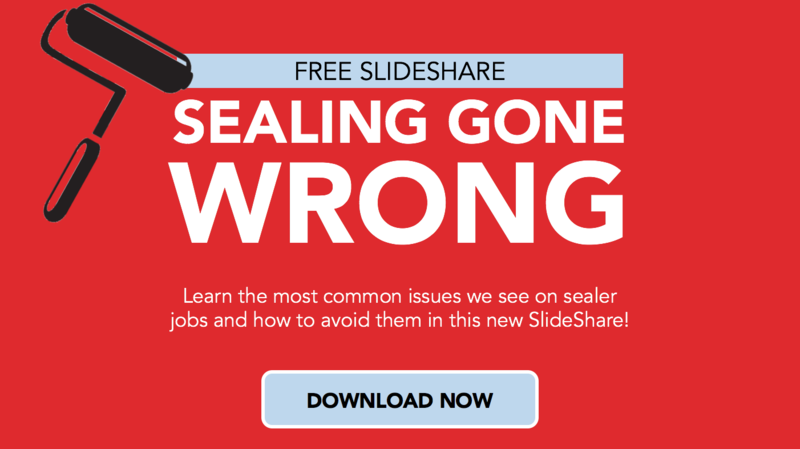 Be sure to read our blog post, How To Prevent Common Sealer Issues. 2. Sealing wet-cast pavers can be like trying to stick tape to a table covered in sawdust. Sealing wet-cast pavers can be frustrating and ineffective if you’re using the wrong product. Enter the Alliance Gator Signature Series WetCast and WetCast Plus Color Enhancer Sealers! So what’s the deal with wet-cast and why does it require a special kind of sealer? It’s because of all that chalky residue. Envision a table covered in sawdust. If you were to try and stick a plain old piece of Scotch Tape on there, it would stick to the sawdust and not the table. Now try a piece of Duct Tape. The adhesive is much stronger and will be able to bond to the table despite the dusty coating. Basically, our specially formulated wet-cast sealing products are the Duct Tapes of the wet-cast sealer world! 3. Sealing without efflo cleaning is like trying to paint on wood without sanding it. Have you ever tried to paint a piece of wood that hasn’t been sanded or roughed up a bit? The paint will have difficulty adhering to the surface. Well, this is the analogy we use with contractors to explain one of the many reasons to efflo clean before sealing! Using an efflorescence cleaner will slightly etch the surface of the pavers, which will allow the sealer to bond correctly. For more on this subject, check out our blog post, Why You MUST Use An Efflorescence Cleaner Before Sealing Pavers. 4. A heavily trafficked sealed patio is like a waxed car that just returned from a ride to the beach. Oftentimes people will compare their lives to other people’s lives (thank you, Facebook). So if you’re comparing your sealed patio to someone else’s, there’s one very important thing to keep in mind … traffic levels! Patios sealed the exact same way will look different based on wear and tear. Like with a waxed car, for instance. If you wash and wax your vehicle and immediately store it away in the garage, it’s going to look phenomenal the next time you go take it out for a spin. If you wash and wax your car and then make a trip to the beach, it’s certainly not going to look as pristine as the waxed car hiding under a blanket inside of a garage. Outdoor sealed surfaces will look dramatically different from one to the next based on how often they’re used. Do you have other useful analogies you use with your clients to explain hardscaping products or processes? Please share in the comments section below.